Are you considering moving from Chicago to an overseas destination? As much as individuals look forward to the experience of living overseas, it takes a lot of work getting there. Whether it’s packing your entire home or office, everyone who has dealt with moving overseas from Chicago can attest that it requires a lot of patience and preparation. There are plenty of international moving companies in Chicago that you may choose to help you in the relocation process. So sets Schumacher’s overseas moving services apart? 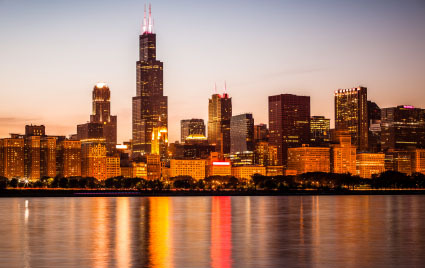 Well, for the last 35 years we have helped individuals and families move overseas from Chicago and numerous other U.S locations to hundreds of international destinations. Depending on where you are relocating to, our team will pick up your goods at your residence and transport them to the nearest departure port. For those moving from Chicago to Europe, your cargo will be transported to our east coast warehouse. Those headed to Australia or New Zealand, goods are delivered to Los Angeles and prepared for ocean transport. Our international moving service always works constantly to determine the best options. We’ll recommend the most appropriate departure port that’s convenient for you and your budget. Since America’s windy city isn’t located close to any of the main ports, we’ll arrange for pick up (packing and wrapping if you’d like! ), storage before your effects get on the water, U.S customs clearance and paperwork. We also offer customers a few different options when moving. If you are moving an entire household from Chicago or a nearby suburb, shipping in your own container is possible. If you have only an office or a few bedrooms, then our Chicago international moving service specializes in consolidated shipping. This means lower rates for you because you’ll be dividing a container between other shipments bound for your final destination. If you have any questions or would like to get an easy no-hassle quote from one of our experts, give us a call at 800-599-0190 or fill the quick quote form. It really is that easy and we hope we can help you with your move!